Everything is in flames, the sky with lightning, the water with luminous particles, and even the very masts are pointed with a blue flame. What Charles Darwin witnessed was St. Elmo’s Fire. But what is it? And why did sailors, who are generally superstitious, believe it was a good omen? St. Elmo’s fire is a meteorological phenomenon that happens when there is a strong electrical field in the air, like during thunderstorms or volcanic eruptions. It is plasma, or ionized air, that sparks off pointed objects, sharp corners, or metal edges, and emits a blue or purplish glow. Scientifically, it is a corona discharge. As defined by Wikipedia, the discharge occurs “when one of two conducting surfaces (such as electrodes) of differing voltages has a pointed shape, resulting in a highly concentrated electric field at its tip that ionizes the air (or other gas) around it”. How did St. Elmo’s fire get its name? It’s named after the patron saint of sailors, St. Erasmus, a bishop in Formia, Italy. During the persecution of Christians, legends say he was captured, imprisoned, tortured, miraculously healed, and escaped, several times over. Despite the dangers and threat of certain death, Erasmus continued to preach, convert pagans to Christianity, and conduct baptisms. He met with a grizzly end (and martyrdom) after being captured again in the Roman province of Illyria. His abdomen had been slit open, his intestines were pulled from his body, and slowly wound around a windlass—the winch-like device used for raising a ship’s anchor. 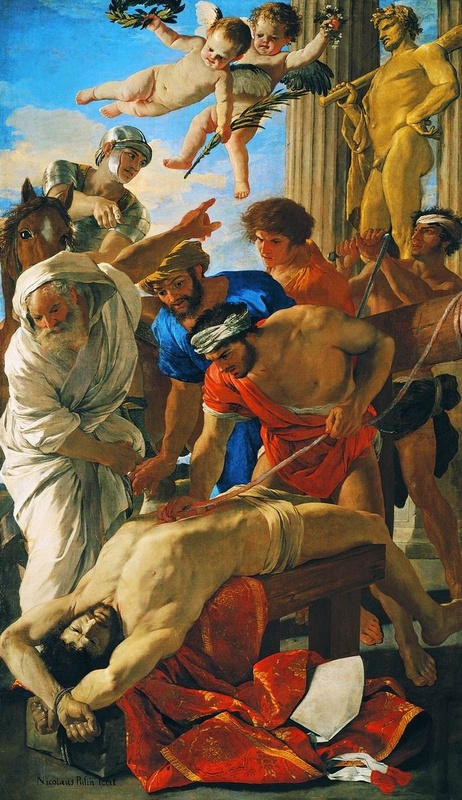 Another legend states that the Christian martyr once continued to preach after a lightning bolt struck the ground beside him. 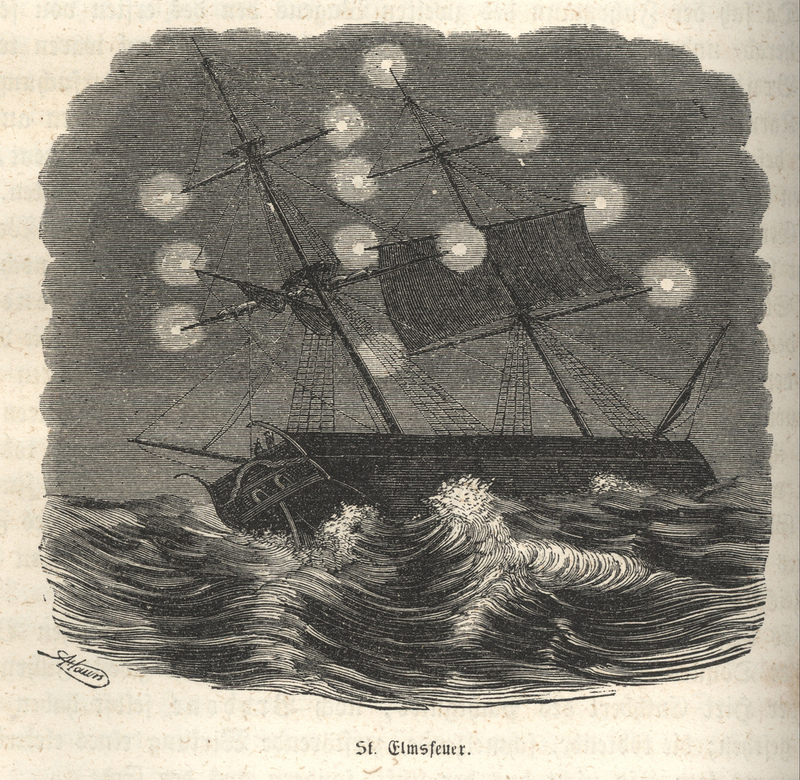 This lead to sailors believing that St. Elmo was appearing to them during storms. The phenomenon often happens near the end of a storm and was considered a good sign calmer weather was ahead. 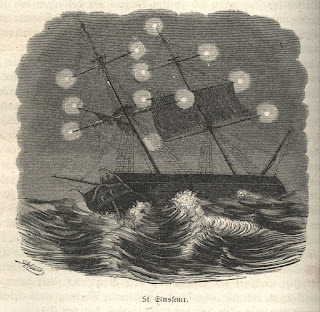 And thus why sailors weren’t frightened of the blue flames or glowing balls around the masts and yardarms. The saint was present, he’d protect them. St. Elmos’ fire isn’t just a nautical weather event. The electrical discharge can be seen most anywhere there is a pointed object. Think steeples, radio towers, leading edges of aircraft, even on the horns of cattle. Crazy! Here is a video that helps to understand how it works and what it looks like.